Lush products are my guilty pleasure. It’s okay, we can be honest about it. I’ve always appreciated how they work as a brand. Specifically they do not conduct animal testing, use fresh ingredients, partake in ethical buying, 100% vegetarian, handmaid, and use little to know packaging (which is why they coin themselves as “naked”). I love the company and I love how they conduct business. But ultimately it’s their products I love. Here are my favorites! This was once gifted to me from a friend and it changed my world! It’s 1.9 ounces of solid shampoo that gives over 80 washes, I can’t even get that much from a regular bottle of shampoo. I know what you’re thinking… solid shampoo? They actually lather extremely well when exposed to running water and a little bit of friction. 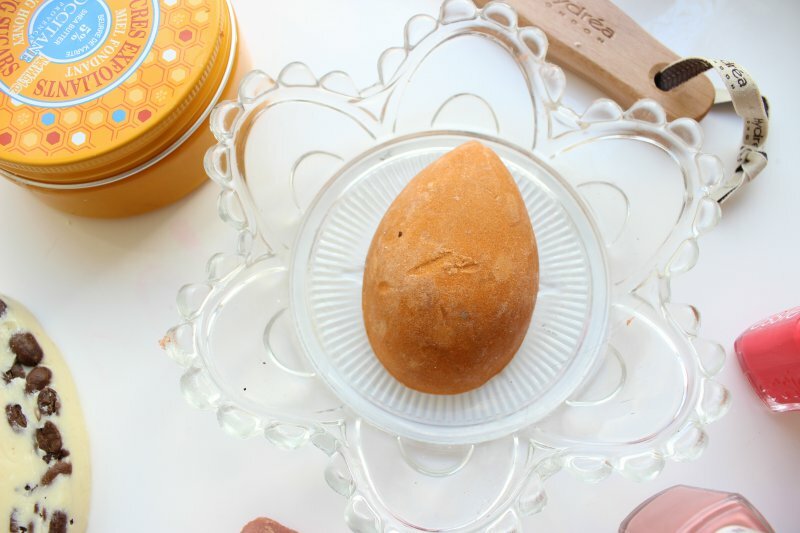 You can lather in two ways, run the shampoo bar until shampoo has lathered onto hands, then apply to hair. The other way is wetting the bar and rubbing it into hair, having shampoo lather and applyit at the same time. This is my preferred option. Wonderfully there are multiple shampoo bar scents to select from, but Jason and the Argon Oil is my favorite and only choice. I appreciate the cheeky mythology reference in the title as well as how soft my hair feels from the nutrients of the Vitamin C in the argon oil. In case I haven’t mentioned, it is a lovely smell! Each shampoo bar costs $11.95, which can be purchased online and in Lush stores. Personal recommendation? Get it with the round tin can. A big perk to using solid shampoo is that no packaging is necessary. After use, lightly place it on a towel outside the shower. After a few minutes pat it down a bit and place dry bar in round tin can. Perfect for travel or everyday use. Never have truer words been said about my favorite hiking shoes, which are water proof and hodl their grip. They’re perfect for hiking, climbing, and water sports. Though their rubber form provide fantastic arch support, it led to cracked heels and other gnarly damage to the skin on my feet. The solution? “Go tell Lush your problems” I told myself. When I gleefully strolled into my Lush store, I told the associate my needs. She recommended Pumice Power right away and it rescued my feet. I saw results immediately and my soft feet looked brand new in two weeks time after using it everyday. Pumice Power by Lush actually contains, not surprisingly, pumice powder. Therefore, use it like you would a pumice stone. I use it after the shower on my wet feet, scrubbing at the parts in need some loving. The product exfoliates and smooths the skin. After washing it off apply some cream or lotion to finish the heels. Pink Peppermint is a smooth cream that pairs well. Thankfully I am not in as desperate need for this product as before but merely use it for routine exfoliation. Purchase a Pumice Power Bar $4.95 either online or in Lush stores. My discovery of this gem was very simple, I heard about it. I would see it in the stores and thought it looked gorgeous, and eventually purchased it. Boy is this bath bomb such a treat! All bath bombs work the same. Fill your tub with warm water and drop the bomb in. The bath bomb reacts to the water as it fizzes out, releasing its scent and vibrant colors, filling the bathtub with goodness. That’s how all of the bath bombs work, but what happens with this one is so much more! Intergalactic not only has a soothing peppermint scent, but the neon colors make the bath look absolutely gorgeous. Intergalactic is truly out of this world once the bath is set and you see the millions of shimmery glitter that fill your tub with stars. It’s subtle but absolutely beautiful! I was pleasantly surprised once I noticed the cosmic stars all around me. 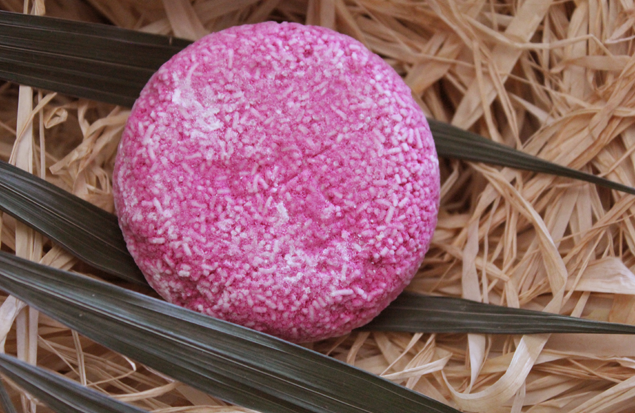 This bath bomb costs $7.95 each, can be purchased online or in the stores. Oh how I love this bubble bar. I found this around one of the first times I went to Lush. 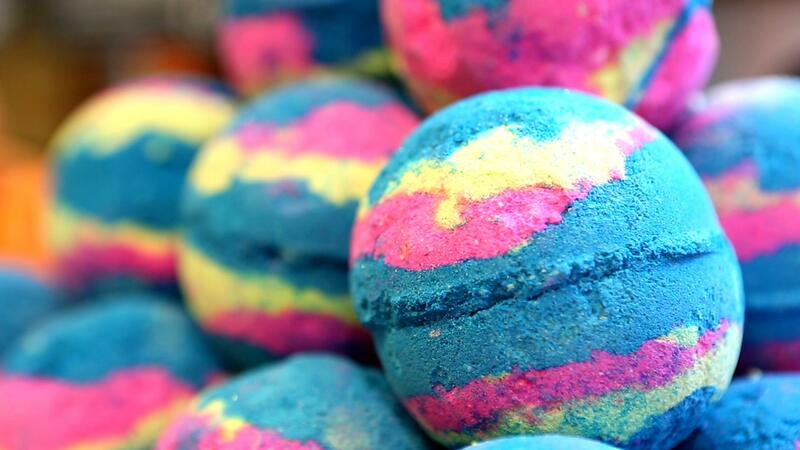 If you’ve been inside the store you know that the bath bombs and bubble bars display is so exciting… Color! Fun! Joy! It’s great. When I finally built the courage to treat myself, I picked this for the pretty colors. No regrets. Bubble Bars can get about 2-5 uses per bar. I cut them up and crumble them underneath the running water. Enjoy the bubbles fill the bathtub along with the infusion of the color and scent from the bar. I love how much the Brightside Bar has such a lovely tangerine scent that gives such positive feels. 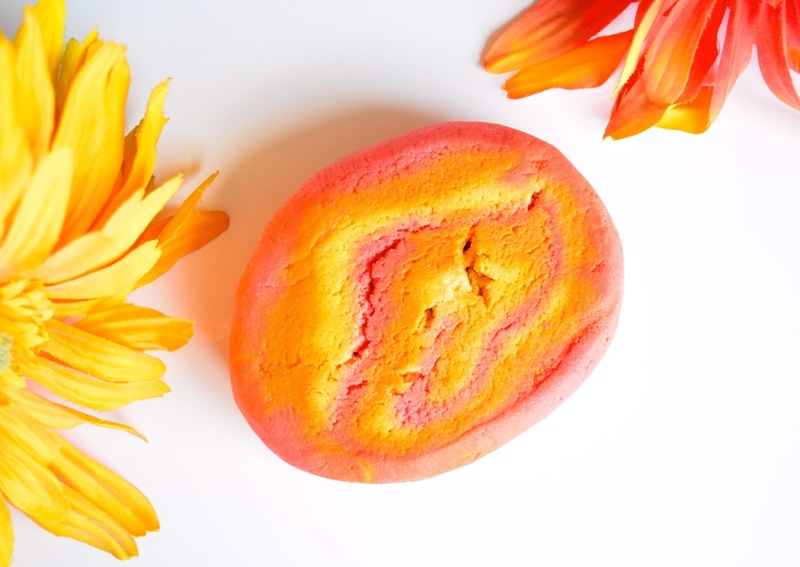 Brightside Bubble Bar costs $12.95 each, available online and in stores. Absolutely my hands down favorite face mask! Apply to dry face and leave on for 15-20 minutes. The mask does harden, but not overly restrictive like other masks. When water is applied to wash off, the mask actually softens once again and continues to exfoliate the skin as it gets washed off in circular motions. 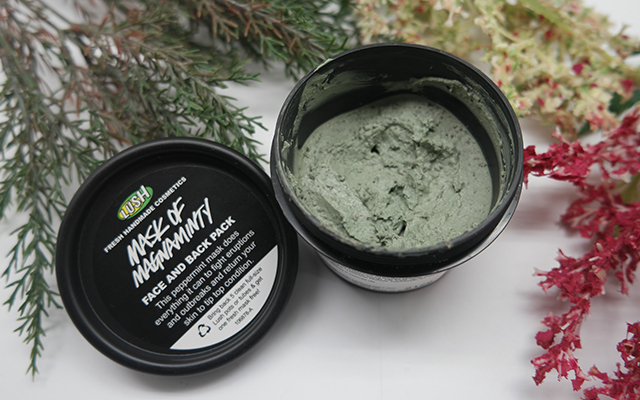 I love that the mask is made up of mint and feels so fresh on my face when used! I’ve learned how important it is to lay down a towel around the sink when washing off, seeing as it requires a fair amount of water to get the chunky mask off. If you wanted to purchase the Mask of Magnaminty the small 4.4 oz. tub costs $14.95 and the 11.1oz. tub costs $28.95. These can be purchased online or in stores. Though there are many products I enjoy from Lush, these are my top favorites! If you want to just covet Lush products from afar to learn more about the products and the company, might I suggest following some Lush YouTube vloggers? Check out Gwen In Real Life!